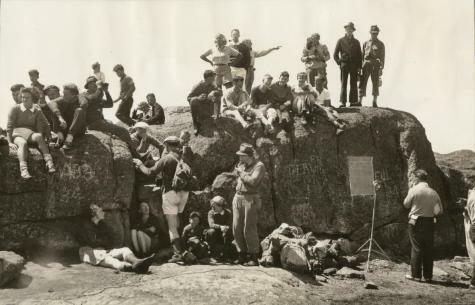 Group of climbers on the summit of Mount Marcy, who climbed the mountain as part of the 100th anniversary celebrations of the first recorded climb by Prof. Ebenezer Emmons. To the right a commemorative plaque can be seen in the stone face. In front of the plaque is a microphone; commemorative addresses were broadcast by the General Electric Company. Source: Adirondack Museum Library, Harry Wade Hicks papers, MS 63-270, box 4, folder 4.